The Cabbage Patch doll phenomenon took the world by storm – overnight, it seemed, those strange little people were everywhere. And now, more than 20 years later, they’re still popular. It all began with a young American art student called Xavier Roberts. He had the idea of experimenting with the almost forgotten art of cloth sculpture – making a three dimensional image from a flat piece of fabric. Xavier created a sries of dolls which he called ‘Little People’. They were an instant success. In 1978 he formed the Original Appalachian Artworks Inc., using an old clinic in Georgia as a showroom and renaming it Babyland General Hospital. Today this is a great tourist draw, attracting thousands of visitors who come to see the babies being born – delivered from inside a mother cabbage by a uniformed nurse! The OAA dolls had cloth sculptured heads and hand painted faces. Xavier realised he was onto a winner, if only he could think of a way of manufacturing his dolls more quickly and less expensively. Obviously the answer was to mass-produce, using vinyl for the heads (the tricky bit), and cloth for the bodies which did not need so much sculpting. 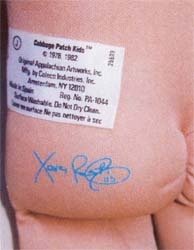 Xavier joined forces with Coleco industries, and by 1983 the dolls were in production, now called Cababge Patch Kids. 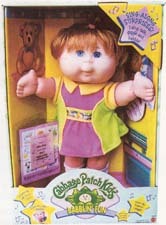 With great flair for merchandising, Xavier announced that every dolls was different and dreamt up the cabbage patch story line. Perhaps the biggest selling point was that each baby came with an adoption certificate and its own special name. Millions of people were enthralled by the idea of owning a unique cloth baby, and little girls were enchanted to know that their doll was the only one of its kind in the whole wide world. Today, most people know what a Cabbage Patch Kid looks like, but at the time they were revolutionary. The kids had transfer character eyes which came in a variety of colours including blue, grey, brown, hazel, green and black. Many head moulds were produced, so you could choose your ethnic group, decide whether you wanted a biy, girl or baby, and then select the nose shape, dimples, freckels, eye colour, hair colour and style, teeth, and shape of mouth – the permutations were endless. 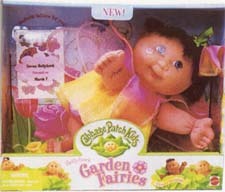 What pleased every small girl was the fact that the Cabbage Patch Kids had belly buttons! Not small, neat ones but satisfying round lumps. People fell into two schools – they either loved the dolls or loathed them; it seemed there was no middle of the road. Some thought the quirky smiles, cuddly bodies and wide-open ‘hug me’ arms endearing, but others called the faces grotesque and disliked the adoption gimmick, which they felt was a slur on children who really needed to be found homes. 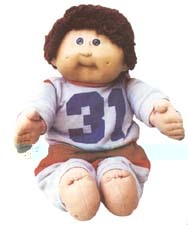 Each Cabbage Patch Kid came with adoption papers, and new owners were meant to raise their right hand and say ‘I promise to love my Cabbage Patch Kid with all my heart. I promise to be a good and kind parent. I will always remember how special my Cabbage Patch Kid is to me’, in front of a witness. Later, the promise was altered to make owners remember that ‘ being different is what makes us so special’. It seems that the people took the promise lightly, going by the vast numbers of second-hand Cabbage Patch Kids around. Other colours included green, blue, red, purple and aqua. The dolls also bear labels in their sides which state details of manufacturer, because Coleco licensed other companies to make them too, such as Jesmar (Spain), Triang Pedigree (South Africa), Tsukuda (Japan) and Lily Ledi (Mexico). In 1989, Hasbro took over the licensing agreement with Coleco, launching several new lines. Mattel began marketing an producing the Kids in 1995, and still make the dols today. Amongst their creations are Face Painting, Brushin’ Teeth, Haircut Magic, Spalsh ‘n’ Fun Baby, Garden Flower Fairies and the notorious Snacktime models which were withdrawn following complaints that the dolls had tried to eat childrens hair! 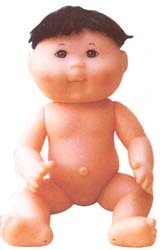 Mattel also introduced mini Cabbage Patch Kids with beanie-type boides. Many of the modern dolls are all vinyl, constructed wth swivel heads, arms and legs like a conventional doll, though they still have the famous navel. Those very first dolls made by Xavier, hand-signed now command thousand of dollars, while many of the later, cloth faced editions are valuable too! OAA still make dolls with cloth faces, and Hasbro produced a special 10th anniversary edition in 1992 which featured cloth heads. Worlds away from the beauty of antique porcelain dolls, Cabbage Patch dolls have a friendly, kid-from-next door appearance. If you’re looking for colourful and cheerful collectable dolls, then these are for you. And just think, if every kid is different, they must be the ultimate limted editions!